At first glance from above it looks like any clean and neatly planned small town, complete with sports grounds, neat roads and large civic buildings. But the town is on Subi reef in the Spratlys archipelago of the hotly contested South China Sea and, regional security experts believe, could soon be home to China's first troops based in the maritime heart of Southeast Asia. Private sector data analysis reviewed by Reuters shows Subi, some 1,200 km (750 miles) from China's coast, is now home to nearly 400 individual buildings – far more than other Chinese islands. Subi could be the future location of hundreds of People's Liberation Army marines, as well as a possible administrative hub as China cements its claim with a civilian presence, security analysts and diplomatic sources say. The data from Earthrise Media, a non-profit group supporting independent media with imagery research, was based on surveys of high-resolution images obtained by DigitalGlobe satellites, dating back to when China started dredging reefs in early 2014. The images show neat rows of basketball courts, parade grounds and a wide variety of buildings, some flanked by radar equipment. Earthrise founder Dan Hammer said his team's count included only free-standing, permanent and recognizable structures. "When I look at these pictures I see a standard PLA base on the mainland – it is incredible, right down to the basketball courts," Singapore-based security analyst Collin Koh said after reviewing the data and images. "Any deployment of troops will be a huge step, however – and then they will need to secure and sustain them, so the military presence will have to only grow from where it is now." Senior Western diplomats describe the placement of troops or jet fighters on the islands as a looming test of international efforts to curb China's determination to dominate the vital trade waterway. 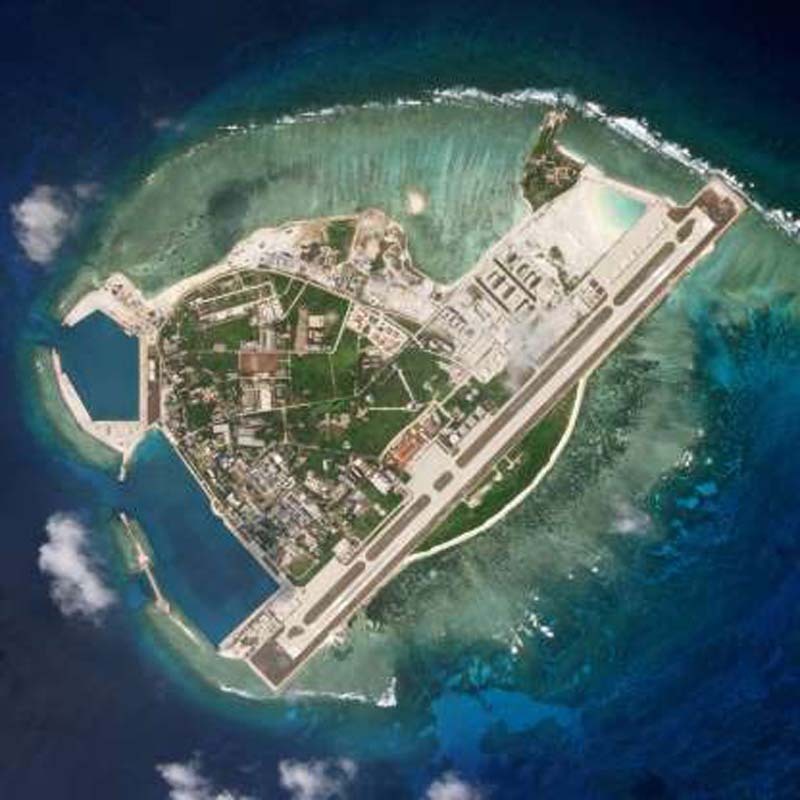 Subi is the largest of China's seven man-made outposts in the Spratlys. The so-called "Big Three" of Subi, Mischief and Fiery Cross reefs all share similar infrastructure – including emplacements for missiles, 3km runways, extensive storage facilities and a range of installations that can track satellites, foreign military activity and communications. Mischief and Fiery Cross each house almost 190 individual buildings and structures, according to the Earthrise analysis. The previously unpublished data details the building count on more than 60 South China Sea features, including those occupied by Vietnam, Malaysia, Taiwan and the Philippines. The number of buildings on Subi makes it similar in size to Woody Island in the Paracels, a Beijing-controlled group much closer to China also claimed by Vietnam. Woody is the base and surveillance post which foreign military attaches say is the headquarters of the military division across the South China Sea, reporting to the PLA's southern theater command. Koh and other analysts said the facilities on Subi, Mischief and Fiery Cross could each hold a regiment - between 1,500 to 2,400 troops. China's precise intentions remain unclear and Chinese experts say much will depend on whether Beijing feels threatened by regional security trends, particularly U.S. activity such as its so-called "freedom of navigation patrols". China's defense ministry did not respond to Reuters questions about the build-up on Subi or what the facilities could be used for. Beijing has consistently said the facilities on its reclaimed islands are for civilian use and necessary self-defense purposes. China blames Washington for militarizing the region with their freedom of navigation patrols. Ding Duo, a researcher at the Chinese government-backed National Institute for South China Sea Studies, said Beijing needs a military presence in the Spratlys to protect its civilian infrastructure. "As for how big that presence is depends on the threat assessment China has going forward for the Nansha Islands," he said, using the Chinese name for the Spratlys. "The Nansha region faces severe military pressure, especially since Trump took office and increased freedom of navigation patrols. So China has raised its threat assessment." The White House said this month it had raised concerns with China about its latest militarization after CNBC reported anti-ship cruise missiles and surface-to-air missile systems had been installed on Subi, Mischief and Fiery Cross. This weekend, China revealed bombers had conducted take-off and landing training on some of its islands and reefs in preparation for what it called "the battle for the South China Sea". Some U.S. analysts noted PLA photographs appeared to show a bomber landing on Woody Island in the Paracels, and the Chinese military has yet to confirm planes actually landed on its Spratlys holdings. On Wednesday, the Pentagon withdrew an invitation for China to join a major naval drill because of Beijing's continued militarization of its islands in the South China Sea. Admiral Philip Davidson, the nominee to be the next commander of all U.S. forces in the Pacific, said last month the bases were now complete and lacked only deployed forces. "Any forces deployed to the islands would easily overwhelm the military forces of any other South China Sea-claimants," Davidson told a congressional panel. So far, repeated U.S. naval patrols close to Chinese features and growing international naval deployments through the region have had little obvious impact on Beijing's plans. "There is a real sense among Western nations that a new strategy is needed, but there is little sign anything meaningful coalescing," said one senior Western diplomat familiar with discussions across several countries. "The deployment of jet fighters – even temporarily – will sorely test that lack of a cohesive response." Already large Chinese amphibious landing vessels and other ships have used the full-scale naval wharves at Fiery Cross, Subi and Mischief – pointing to what foreign naval officers describe as virtually a permanent presence throughout hotly contested waters. Chinese forces are using their island holdings to police of what Chinese naval officers tell other navies is a "military alert zone" – an ambiguous term that both Asian and Western military officials say holds no basis in international law. People briefed on recent Western intelligence reports describe an intensifying pattern of radio challenges to foreign military ships and aircraft delivered from Chinese naval ships and monitoring stations on Fiery Cross. Australian officials recently publicized a "robust but polite" Chinese challenge to three of its naval ships plying the South China Sea en route to Vietnam. Sources say such exchanges between Chinese and foreign militaries are far more frequent than is widely known. "They have become the rule rather than the exception across significant areas of the South China Sea," one person familiar with recent Western security reports told Reuters. Ships and aircraft from India, France, Japan, New Zealand and rival claimants Vietnam, Malaysia and the Philippines have also been similarly warned, according to regional military officials and analysts. With the claimed "military alert zone" having no basis in international law or military practice, foreign naval officials routinely stress they are in international waters and continue on their way. Zhang Baohui, a Chinese security expert at Hong Kong's Lingnan University, said Beijing was likely to be cautious about any offensive moves, such as the stationing of combat aircraft. "Now the islands are complete, I think we will see a degree of caution in Beijing's next moves," he said. "Sustaining that presence so far from the Chinese coast is a massive undertaking, and I think the deployment of troops and jet fighters would really cross a threshold for China's neighbors." U.S. military officials insist they are leaving little to chance, warning the bases are already helping China project military power into areas once dominated by its neighbors. "In short, China is now capable of controlling the South China Sea in scenarios short of war with the United States," Davidson said in his testimony last month.